* This is my article yesterday in BWorld Weekender. 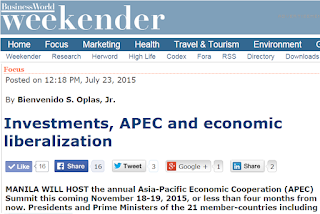 MANILA WILL HOST the annual Asia-Pacific Economic Cooperation (APEC) Summit this coming November 18-19, 2015, or less than four months from now. Presidents and Prime Ministers of the 21 member-countries including the three largest economies in the world, US, China and Japan, will be coming to Manila for two days to discuss and sign certain agreements related to trade, investments and related concerns. The Philippines’ trade and investments in the face of ASEAN integration just five months from now was also discussed last July 15 at the Tower Club in Makati City, sponsored by the Albert Del Rosario (ADR) Institute. The convenor and main speaker was Dr. Epictetus Patalinghug (UP College of Business Administration, and a Trustee of ADR Institute). Discussants were Dr. Gilbert Llanto (President of the Philippine Institute for Development Studies/PIDS), Dr. Ramon Clarete (UP School of Economics/UPSE Prof. and former Dean), Mr. Donald Dee (Honorary Chairman, Philippine Chamber of Commerce and Industry/PCCI), and Atty. Wilfredo Villanueva (Head of Tax and General Counsel, SGV & Co.). In his presentation, “The Role of Exports and Foreign Direct Investments in Industrial Development,” Dr. Patalinghug said that the five striking resemblance among highly successful economies were: (a) Openness to the global economy, (b) Macroeconomic stability, (c) High saving and investment, (d) Market allocation, and (e) Leadership and governance. That is an objective and correct assessment. And it is not unique to the Philippines or its neighbors in the ASEAN, but rather the general trend for the rest of the world. If we check the economic integration and liberalization of the four newcomers to the ASEAN, namely Cambodia, Myanmar, Laos and Vietnam (CMLV), their pace of liberalization in trade and investments on average was much faster than the Philippines. * Americas: Peru 18x, Mexico and Chile 10x, US 7x, Canada 6x. * North Asia: China 15x, S. Korea 12x, Japan 9x, HK 7x, Taiwan 5x. * Southeast Asia: Vietnam 23x, Singapore 17x, Indonesia 16x, Thailand 13x, Philippines 11x, Malaysia 6x. Australia, New Zealand and PNG did not experience significant FDI expansion. Russia and Brunei are the “outliers” with 114x and 103x expansion, respectively, mainly because they have very low base in 1994. Russia has emerged from partial disintegration where a number of central Asian economies (Georgia, Kazakhstan, Tajikistan,…) separated from the former USSR. 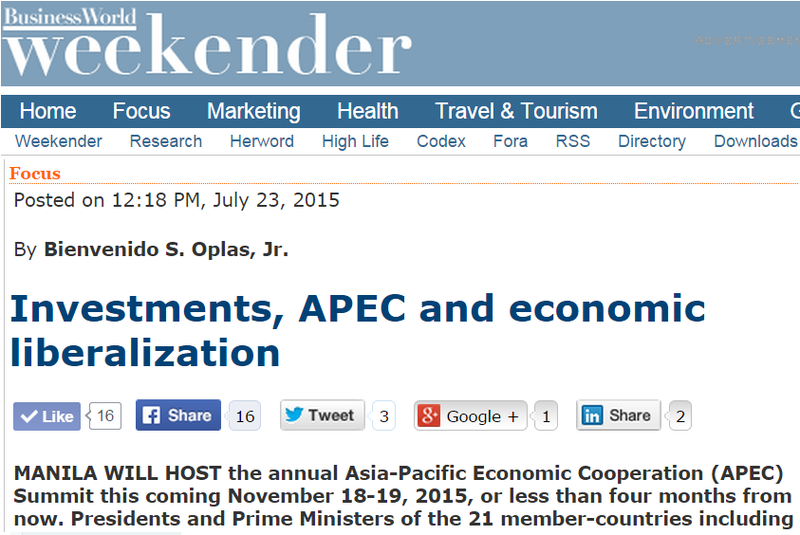 APEC was formed in 1989 but Russia, along with Vietnam and Peru, joined it only in 1998. 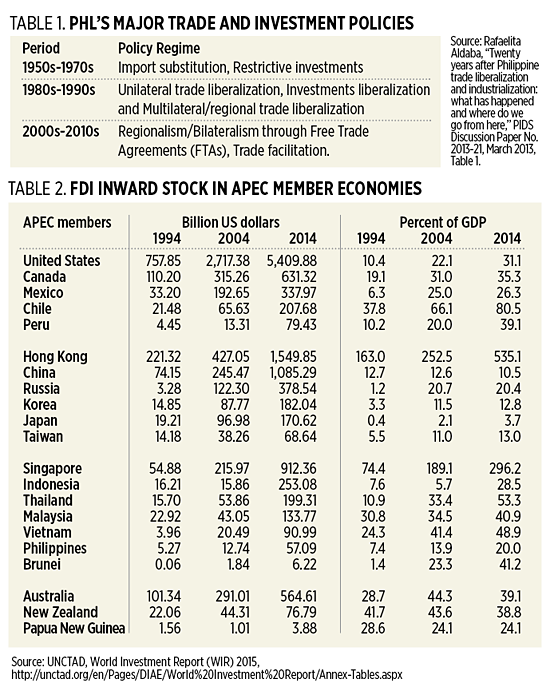 In terms of FDI stock/GDP ratio, three economies that have undertaken unilateral trade liberalization (meaning no or little trade negotiations) stand out: Hong Kong, Singapore and Chile, with ratio of 535%, 296% and 80%, respectively. One, openness to trade almost always results in high attractiveness to foreign investments and all the opportunities they bring -- technological, financial, managerial, and market access. Clear examples are HK, Singapore and Chile. Also the socialist economies China and Vietnam that allowed certain degrees of economic freedom and the market system. Two, global capitalism is about integration and competition, complementation and substitution, happening simultaneously. Business risks will always be there. Companies and people need to keep their radar for adaptation and familiarization of those risks, while keeping the pace of innovation at regular or higher levels. Three, for the Philippines, its FDI stock/GDP ratio of 20% is the lowest among its neighbors in SE Asia, but this is not something to look down or commiserate. Some richer economies have rates lower than 20% like Taiwan, Japan, S. Korea and China. Nonetheless, this should be one reminder that the country needs to amend its Constitution to remove protectionist provisions that restrict or prohibit foreign investments in many sectors of the Philippine economy. Four, more than low taxes and/or high profit, foreign businessmen are concerned more with the security of their investments, that threats of confiscation and political harassment are zero or kept to the minimum. Respect of private property, rule of law, and economic freedom by the people, producers and consumers alike, domestic and foreign entrepreneurs alike, are important factors to attract, retain and expand investments in the economy. Bienvenido S. Oplas, Jr. heads the free market think tank, Minimal Government Thinkers, Inc., and also a fellow of the South East Asia Network for Development (SEANET), a regional center that advocates trade and investments liberalization.